"That means 10 points for everyone ... including me." Matthew: Well, I appreciated the credit at the end. I've worked 20 years on the SAB; it's good to see that it's used now and then. But that's not why I posted it. I posted it because I thought it was well done. Of course you will notice that the list at the end of the blog of crimes punishable by death are all old covenant laws and the only one that is new convenant is to love The Lord - in which case the punishment of "death" is referring to not inheriting eternal life. Hence - Jesus Christ. You know... the "saviour" of the world. So how doyou address all the contradictions given that people will defend it to "death" how all these contradictions have meanings which if we are patient enough we shall understand in time to come? I've worked 20 years on the SAB; it's good to see that it's used now and then. 20 years well spent - now back to work ! 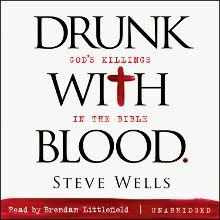 "Of course you will notice that the list at the end of the blog of crimes punishable by death are all old covenant laws and the only one that is new convenant is to love The Lord - in which case the punishment of "death" is referring to not inheriting eternal life. Hence - Jesus Christ. You know... the "saviour" of the world." Something I've been wondering. you say now that jesus came we don't have to follow the old laws, however in romans 3 it seems to talk about how whilst faith is all that is required, you should still stick to the law. I don’t believe we should sin recklessly becuase we believe Jesus died on the cross and therefore we are forgiven – *I* think if people live that way they do not have a correct or accurate understanding of Grace. *I* do believe our salvation is no longer dependant on our obedience to the law. But in saying that, when Jesus ascended to Heaven He left with us a ‘comforter’ or ‘helper’ in the Holy Spirit. When the Holy Spirit is in us (once we make a decision for Christ) He will guide us in the ways of righteousness as the laws are now no longer written on tablets of stone but on our hearts (Romans 2:14 – 15) – therefore in being led we know right from wrong and in our actions we become ChristLIKE (not Christ). Romans 3:23 in my understanding is saying that God has a standard – the old covenant illustrates this standard. Man could not meet this standard and so would make animal sacrifices. Just as we cannot meet that standard now – so Jesus made that sacrifice for us. When Christ came as high priest of the good things that are already here,[b] he went through the greater and more perfect tabernacle that is not man-made, that is to say, not a part of this creation. 12He did not enter by means of the blood of goats and calves; but he entered the Most Holy Place once for all by his own blood, having obtained eternal redemption. 13The blood of goats and bulls and the ashes of a heifer sprinkled on those who are ceremonially unclean sanctify them so that they are outwardly clean. 14How much more, then, will the blood of Christ, who through the eternal Spirit offered himself unblemished to God, cleanse our consciences from acts that lead to death,[c] so that we may serve the living God! Therefore he fulfilled the old law (blood sacrifice) once and for all when He offered Himself unblemished (without sin) to redeem mankind. Re : Romans 3:31 – The law has not been made invalid - Christ perfectly and completely obeyed the law for us then offered Himself as a penalty for all our lawbreaking (sin) – therefore God’s standards are eternally valid – completely established through Christ.